MPHC Civil Judge Marks / Score Card Check Here. MPHC Civil Judge Final Result Check Here. MPHC Civil Judge 2018 Additional Result Check Here. MPHC Civil Judge 2018 High Court Result Check Here. MPHU Civil Judge Answer Sheet 2018 Check Here. MPHC Civil Judge Answer Key With Question Paper 2018 Check Here. MPHC Civil Judge Interview Letter Check Here. MPHC Civil Judge Mains Admit Card 2018 Check Here. MPHC Civil Judge Grade II Admit Card 2018 Check Here. MPHC Notification is out. MPHC is recruiting for 140 Civil Judge 2019 Score Card Posts. 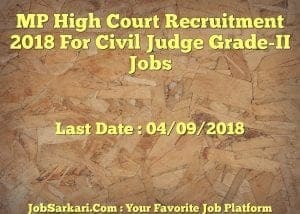 You can check MPHC - Madhya Pradesh High Court last date, download MPHC notification, visit MPHC official website and check other MPHC Vacancy details.Complete Vacancy and recruitment Details about 140 Civil Judge 2019 Score Card vacancies in MPHC are provided below by JobSarkari.Com only for you. Last Date for Apply Online 04/09/2018. Last Date to Correct Application Form 04/09/2018. Date of Preliminary Examination 29/09/2018. General / Other State Rs.1000/-. OBC / SC / ST Rs.600/-. Mode of Payment Application Fees Can be Submitted through Online Mode. Civil Judge 70 20 22 28 140. Candidate Must Have Passed Bachelor Degree in Law. 1.The Candidates can apply through Online mode. 6.Online Application can be Submitted on or Before 04th September 2018. Q. 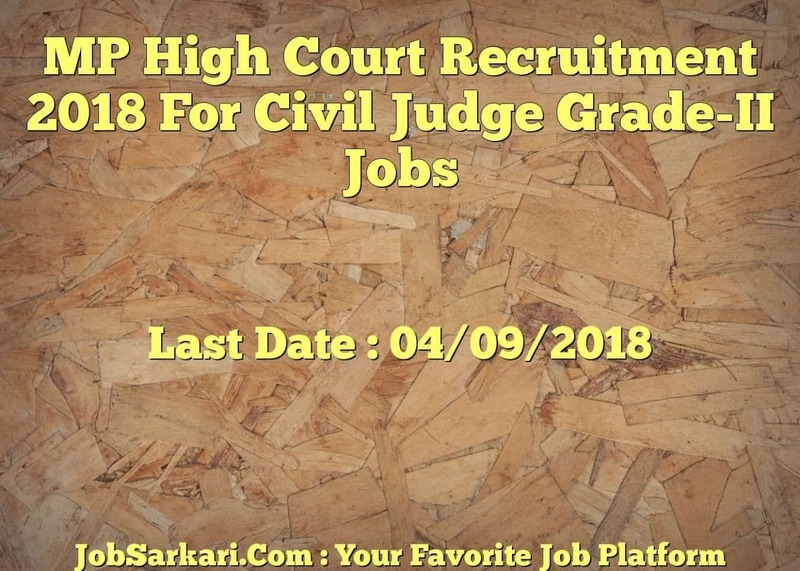 What is the Last Date For MPHC Civil Judge 2019 Score Card Vacancy ? A. Last Date for MPHC Civil Judge 2019 Score Card Posts is 04/09/2018. Q. What is the Form Type of MPHC Civil Judge 2019 Score Card Recruitment ? A. The Form Type for MPHC Civil Judge 2019 Score Card Posts is Online. Q. How many vacancies are available in Madhya Pradesh High Court Civil Judge 2019 Score Card Posts ? A. There are about 100 Vacancies in Madhya Pradesh High Court Civil Judge 2019 Score Card Posts. Q. What is the Full Form of MPHC ? A. Full Form of MPHC is Madhya Pradesh High Court .